We had a request from an acquaintance for a non-dairy option to serve as a cake. She was already doing a wedding cake and I originally said she could do a small Angel Food Cake. Then it popped into my head that I could make macarons that were non-dairy. I just had to figure out the right fillings. Then I had an inspiration from a Masterchef New Zealand final episode. 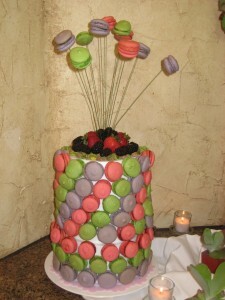 They called it the Flower Macaron Tower on the show. They used buttercream to attach their macarons but that was out for me with the non-dairy request so we used toothpicks. I created three flavors; Strawberry Almond with a Strawberry filling, Blackberry Almond with a Lemon Curd filling and Pistachio with an Orange-Ginger Curd filling. I used my trusted Strawberry Macaron recipe and doubled it. I changed the strawberry powder for blackberry fruit powder. I substituted the Almond Flour for Pistachios ground finely and sifted. I then needed to add a little Almond Flour since the Pistachios are more oily. We used 3 round 4-inch high cake dummies and skewered them together to get the 12-inch height. It took 15 cookies to go around and 8 to go to the top. Plus the ones we skewered on the top using 18-gauge covered wire. I thought the whole thing was pretty ordinary looking until we added the pistachios, strawberries and blackberries on the top. That pulled it all together and made it really look nice. The bride and groom were very happy and we loved doing the project.